"A quick and delicious, fresh, one-pot meal. This is my favorite 'go-to' meal on a busy night. It's full of flavor and really healthy." Place a saucepan over medium heat for about 1 minute and pour olive oil into hot pan. Cook and stir walnuts in hot oil until lightly browned and fragrant, 2 to 3 minutes. Remove from heat and transfer walnuts to a bowl. Heat 1 teaspoon olive oil in same pan; cook and stir shiitake mushrooms until softened, about 5 minutes. Remove mushrooms from pan. Add 1 more teaspoon olive oil to pan; cook and stir chicken and garlic until chicken is browned and meat is no longer pink inside, about 10 minutes. 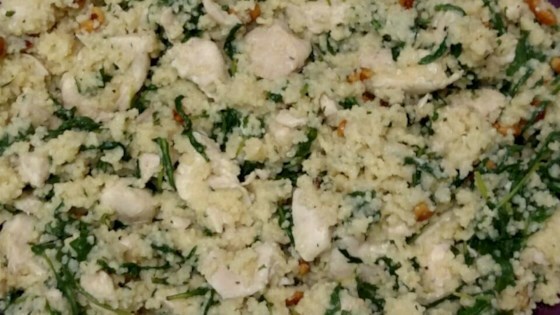 Pour chicken broth into chicken mixture, add arugula, and stir contents of couscous seasoning packet into mixture; bring to a boil and simmer for 1 minute. Stir couscous into mixture, cover pan, and remove from heat. Let stand until liquid has been absorbed and couscous is tender, about 5 minutes. Add walnuts and basil, lightly fluff couscous with a fork to combine, and serve. This is a very versatile recipe. Spinach (or any green) easily substitutes for arugula; or the chicken can be left out and vegetable broth used to keep it vegetarian. I'd probably add more mushrooms (maybe even portobellos) in this instance, to add a little more volume. Pecans or pine nuts could be used in place of the walnuts, top. If you don't have Parmesan couscous, regular couscous can be used, but top with 1/4 cup freshly-grated Parmesan just before serving. I omitted the chicken and used bone broth. This tasted wonderful, and I will definitely be making it again. Decent meal, a little bland.